There are many cloud web map APIs available to embed mapping directly into a web application or web site. Services are available from Google Maps, Bing Maps, ESRI ArcGIS Online, MapQuest and many smaller vendors such as GIS Cloud. This is the first in a series of articles from Georelated providing a summary of some of the major cloud services, their capabilities and key differentiators. The articles are aimed at a technical audience of architects or developers. 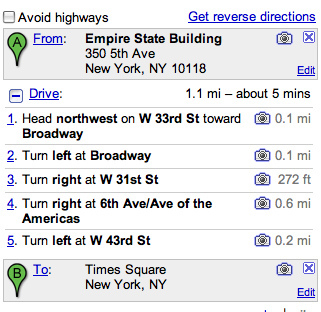 The limitations of Google maps are found when you want to use the map control to support your own GIS data. The map control supports KML, and GeoRSS vector layers and overlays with support for markers and many geometry types. However, creating complex thematic or analytical mapping is more tricky and often leads to compromises. With the massive improvements in web browser performance this is likely to be less of a barrier in the future. 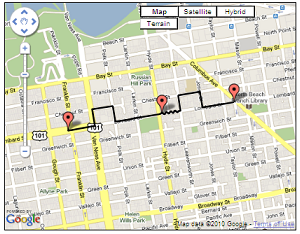 Static Map - Delivers maps (Street View panorama or cartographic map) as static images for embedding into pages. 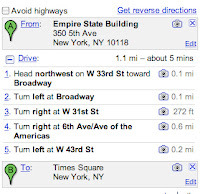 Directions - Provides directions between locations. Distance Matrix - Provides travel distance and time between a matrix of locations. Elevation - Elevation data for all locations on the surface of the earth, including depth locations on the ocean floor (which return negative values). Geocoding - Provides the ability to convert textual addresses into geographic coordinates. 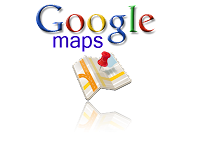 Places - Provides a range of capability to work with places in google maps. This includes check ins, add/remove places to your service, find nearby places to a location and get detailed information about a place. The places api is currently "experimental" so be careful creating production applications on this api. Responses from the web services are delivered in XML or JSON and support SSL is available. Google provides base mapping for a vast array of countries around the world. The coverage is very comprehensive and deep. When this article was published Google map data coverage included 218 countries. Google uses many traditional geospatial data suppliers, captures some of its own data in some regions and supplements these in some less well mapped countries with crowd sourced data using its Map Maker capability. 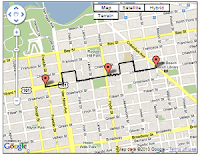 Google Maps API provides wide coverage of street level mapping, terrain and aerial imagery. Street view data is available in 23 countries but other map data sources have very limited coverage. Google geocoding coverage supports currently supports 209 countries however, its unclear how many countries support detailed level geocoding to street, building or parcel level. Developers cannot control in map advertising that Google places on the map. Using the "free" edition Google also requires you to "give Google a perpetual, irrevocable, worldwide, royalty-free, and non-exclusive license to reproduce, adapt, modify, translate, publicly perform, publicly display and distribute Your Content through the Service and as search results through Google Services". The "free edition" license also prevents organizations using the apis to creating asset tracking applications that are not free for users and completely prohibits real time satellite navigation applications. The "For Profit" use is limited to publicly available commercial web sites or free applications. It's worth checking with one of the many Google partners or Google direct if your planning to use Google Maps API in a commercial application. No one wants a license compliance suit from Google! SLA guarantee for up time of the map service but not the geocoding! Support - thanks to the freemium model Google Maps has a very active developer community and there is a wide partner community hence, the need for direct support is much lower. Licensing costs are available with several usage levels based on a fixed price of a defined number of map page load bundles per annum. Organizations planning to use "free" Google Maps APIs should check the alignment of their use with Google or a Google Partner to ensure correct interpretation of Googles licensing. Development: Web Mapping Enabling Technology - Are Flash and Silverlight dead? Technology: 3D GIS Moving from Desktop to the Web?